Single line capacities from 1/4 to 50 tons. Cable drums sized to meet the rope storage requirements, fleet angle restrictions and space limitations of each application. Motor, band, fan, disc and Weston-style brakes as well as vector drives are just some of the available load holding options. Available electrically powered or pneumatic. Each 203 Series Custom Winch is specifically designed for its intended application and can be designed up to a 50 ton winch. 203 Series industrial winches are either built to OEM, government, military and industrial specifications or David Round’s own standards. 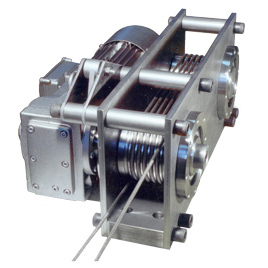 They are ideal for wind power winch or nuclear power winch applications. Upon request, a registered professional engineer may certify winch designs. In-the-field reverse engineering is available to design drop-in replacement winches. 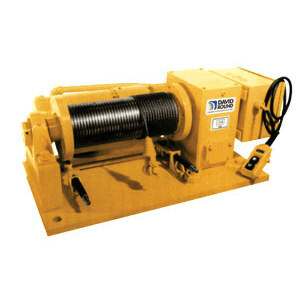 All winches are load tested and certified prior to shipment. Pendant: Various button configurations available for pendants and remote controls. Controls: Single and two-speed control packages available with a standard reversing starter or choose variable speed winch operation with an AC inverter or vector drive. Weather resistant, marine grade and explosion-proof enclosures are available. Gearing: 100% Sealed gearing with oil bath lubrication unless otherwise specified. Right angle, in-line and planetary gear sets accommodate all reduction and space limitation requirements. Wire Rope: Available upon request, wire rope is sized for winch capacity and application. Motor Brake: Provided unless otherwise specified to hold suspended or unstable loads. Cable Drum: Sized to meet loading, cable, fleet angle and space restriction requirements. Motor: Electric motor properly sized for starting and running loads and configured for environmental conditions. Bearings: Precision self-aligning pillow block or flange cartridge bearings with grease fittings. Mountings: Space-saving frame layouts may be sized to match existing mounting requirements. Fittings: Swivel hooks, blocks, clevis fittings and other rope attachments are available. Spooling Aids: Pressure rollers, fairleads, level winds and sheaves available for cable control. Finish: Winches painted safety yellow unless otherwise specified. Epoxy paint is available. Safety Devices: Hook travel limit switches, drum guards, overload detection / auto-shutdown systems, audible/visible alarms and other safeguards are available. 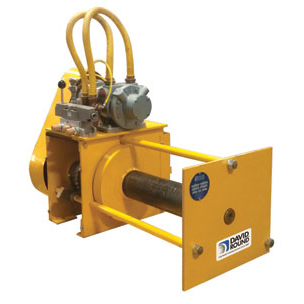 Incorporating an oil shear clutch, the Continuous Tension Winch provides continuous line pulling tension for construction and web handling equipment to automatically advance pipe bursting heads and roller cartridges when back tension diminishes. Frequently used in processing applications for conveyor positioning and for hatch, grate and pump lifting, base-mounted lifting winches are available as a stand-alone unit or as part of an integrated system with sheaves and jib cranes. Weather resistant components make The David Round Company’s marine winches ideal for shipboard use including anchor, ladder and gangway lifting as well as buoy handling. Used under power to pull trailers and mobile homes through production, the Traction/Cart-Pulling Winch is also available in push-pull and traction style designs. 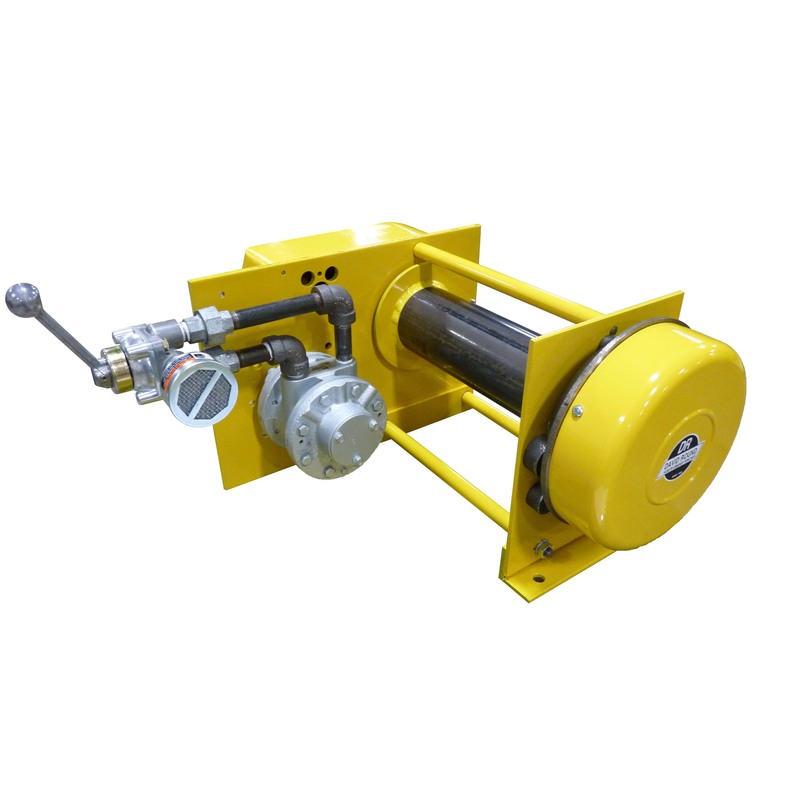 Unlike other winches with load holding brakes, this winch releases cable at a preset line tension, making it ideal for cable stringing applications. 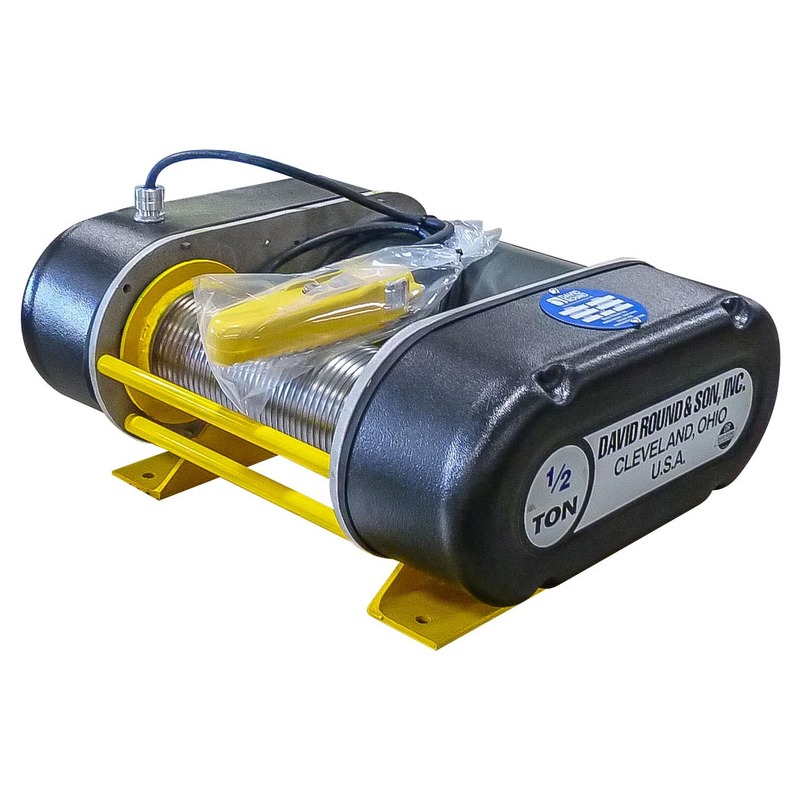 Available in single or dual line configurations, this furnace lifting door winch features high starting torque to pull doors free from seals. David Round hoists often replace aging winches on radial arm stacker / reclaimers. Oversize drums enable winches to store large amounts of rope on a single layer. Many David Round products are available in stainless steel construction. Please consult factory for availability.